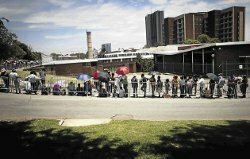 Hundreds of University of Johannesburg students who bunked exams using fake sick notes have undergone disciplinary proceedings. The Saturday Star reported that the proceedings had been completed for 450 of the 520 students accused, and those found guilty could face expulsion. They would also fail the relevant subject and would not be permitted to sit for the supplementary exams. They could also receive a “suspended expulsion”, where they would be expelled if found guilty of a similar offence within a year. The worst offenders could be banned from studying for a year. It was believed that some students handed in sick notes, which purported to be signed by Dr Dre and Wiz Khalifa, the names of American rap artists. University spokesman Herman Esterhuizen said: “We want to set an example for other institutions to follow on ethics procedures and transparency”.